In my previous part of this post I showed the steps for installing AD RMS on a Windows Server 2008 R2 system. In this part I will show how to configure AD RMS so that it can be used with Exchange 2010 for securing emails. 14. After you have logged off and logged back on to the AD RMS system. Open the Active Directory Rights Management Services Console either by using Server Manager or by pointing your mouse to Administrative Tools. Below is the first screen that you get after you launch AD RMS management snap in. Results pane shows the general settings used during the installation. 15. 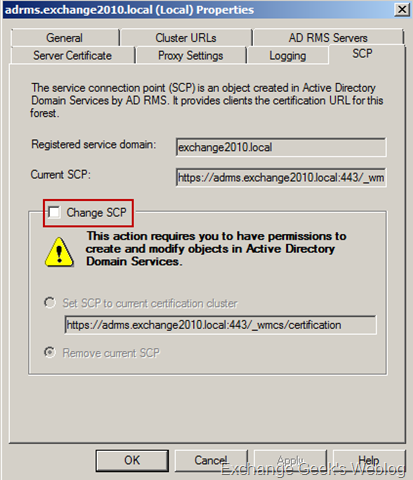 You can also change the registered SCP by right clicking on the server name, right clicking and selecting Properties. On the Properties page select SCP tab. You can also use the same page to remove the SCP. 16. 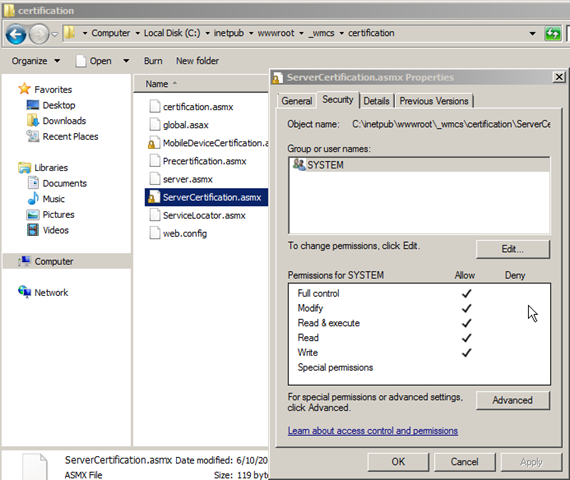 When AD RMS is installed Only SYSTEM account gets full control on the ServerCertification.asmx page. 18. Next step is to enable Super Users on AD RMS cluster. To enable click Enable Super User in actions pane of AD RMS management snap in. 20. 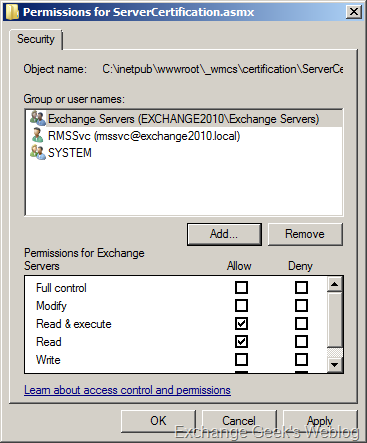 Next is to test the IRM configuration on Exchange 2010 server. To test the configuration open EMS and run the cmdlet Test-IRMConfiguration –Sender "email address of a valid mailbox”. If you see the below screen capture correctly you will notice that the text marked in yellow shows a warning and failure, but this is fine unless you have federated infrastructure. 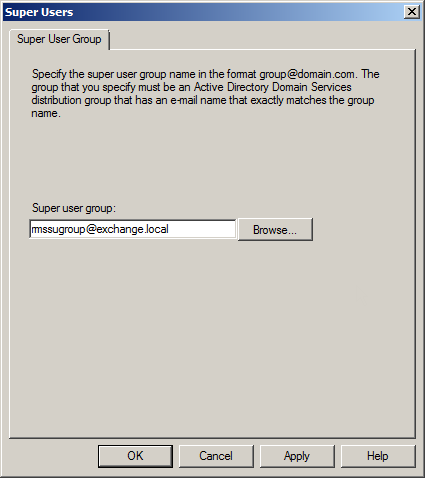 To resolve this problem you must add the FederatedEmailxxxxxxxxxxxxxxxx account must be added as a member of the Super User group that we just configured in previous step. 23. Exchange 2010 OWA can also use IRM to protect your email and their attachments. You must make sure that OWA is correctly configured to use IRM by running Get-OWAVirtualDirectory |FL *RM*cmdlet. For more information on configurable parameters using Set-IRMConfiguration cmdlet you can read at http://technet.microsoft.com/en-us/library/dd979792.aspx. In the next part of this post I will post the ways to use IRM on client side and a little about the considerations about clients.